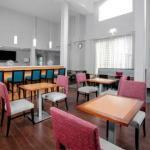 Great location, amenities and awesome continental breakfast (included eggs and sausage) . Great friendly staff and breakfast exceeded my expectations. I was very impressed. And the location was perfect (Disney) I look forward to my next stay there. I thought it was an excellent price for this hotel very nice. All in this entire hotel was a great deal. It?s nice, clean and close to Disney. The breakfast is just one step up from a continental breakfast (add cafeteria sausage and waffles), but certainly adequate for hungry kids in a rush to get to Disney. The beds were ok (I have slept in better)--but for the great rate we got, I can't complain. Great area-close to Disney and plenty of restaurants nearby. Couldn't find access to the pool, both doors were locked. The 147-room Hampton Inn Orlando Lake Buena Vista is one mile from Walt Disney World and provides quality accommodation at an affordable price equally suited to the vacationer or the business traveler. Items included with the room rate are a hot breakfast buffet, high-speed Internet access, local telephone calls, a morning newspaper and parking. Area landmarks and attractions include numerous golf courses, Downtown Disney, Sea World, the Wet 'n Wild water park, Universal Studios, the Islands of Adventure amusement park, Gatorland, the Florida Citrus Bowl, Amway Arena, home of the Orlando Magic basketball team and shopping at the Prime Outlet Shopping Mall, Fashion Square Mall and the Florida Mall. 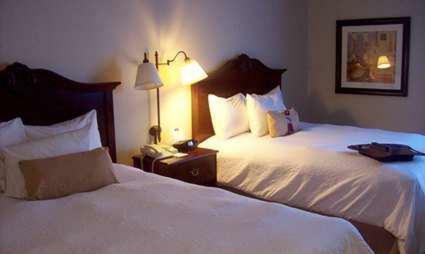 Rooms come with a choice of two queen-size beds or two double beds. The amenities include a work desk with high-speed Internet access, 27-inch television with cable movie and news channels, pay-per-view movies, two-line telephone with voicemail and speakerphone, alarm clock, tea and coffee making facilities, iron and ironing board and a hairdryer. Some rooms have a refrigerator and microwave oven. This hotel has an outdoor swimming pool and a fitness room. The complimentary breakfast is the only meal served here. Restaurants nearby include an Orlando Ale House, Joes Crab Shack, the Havana Café, an Olive Garden and a Kobes Japanese Steakhouse. The 24-hour from desk has safe deposit boxes and information on the Orlando events and attractions. There is a business center, ATM, coin-operated laundry, daily housekeeping and a dry cleaning service. Families who came to Orlando to see Mickey Mouse and his friends say this proved to be the ideal hotel. The Walt Disney World theme parks were nearby, the rates were reasonable and the hotel employees were very child friendly. The free breakfast made a great start to the day before venturing off to the Magic Kingdom. The rooms here were clean, comfortable and well equipped and the pool was a great place to relax after a day of adventures.